Here are some ideas for using our enhanced CD files and how to print our downloads. This is a universal Help Page for using enhanced CDs, but is most helpful to St. Anne's Helper visitors. Step One: Download the zip file to your computer. Step Two: Right click on the zip file to "Extract All". Step Three: Play the audio or print the text. St. Anne's Helper Audio CDs and Audio Downloads are enhanced, meaning that you have two files in one. A printable text file when you buy our CDs or Audio Downloads. Anthony (Confirmation) or Mary (Communion) audio reading the catechism in a pleasant voice. And the verbatim reprintable text of the questions and answers. Each question and answer is on its own track and is verbatim from the printable text. Windows Vista - This is the path to click to set your computer to play the enhanced audio CD. - Play CDs or other media automatically. - Play Audio CD using the program of your choice. Windows XP - This is the path to click to set your computer to play the enhanced audio CD. - Right click on Start Button. - Select "Explore" (not "Explore all users"). - Click on "Auto Play" (tab at top). play the audio of the catechism. Mac Users and others please Contact Us. If you have further difficulty with your own computer's system simply type in the help bar: "CD will not play in Vista" or something similar. 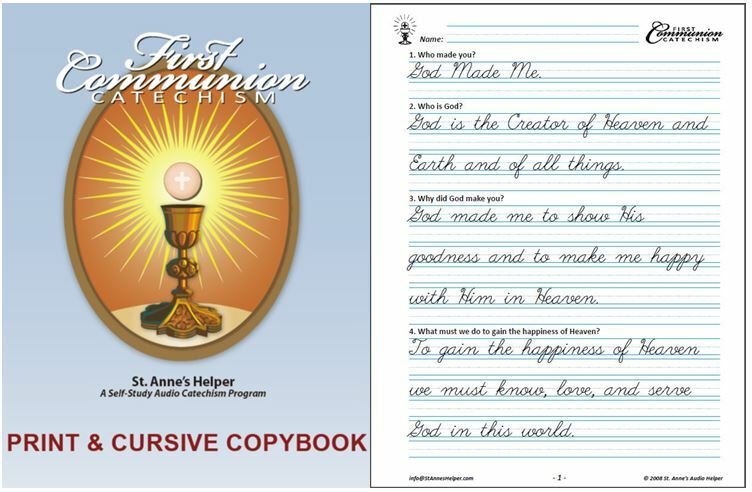 If you're reading this page out of curiosity, you can buy our audio book downloads and homeschool worksheets on our St. Anne's Helper Order page. This text can be printed at will and is fully reproducible from the enhanced CD or the audio book download. You can transfer the text to your other computers and tablets to use as an eReader book. I printed it and kept it next to the couch where we would practice our catechism prayers and answers. 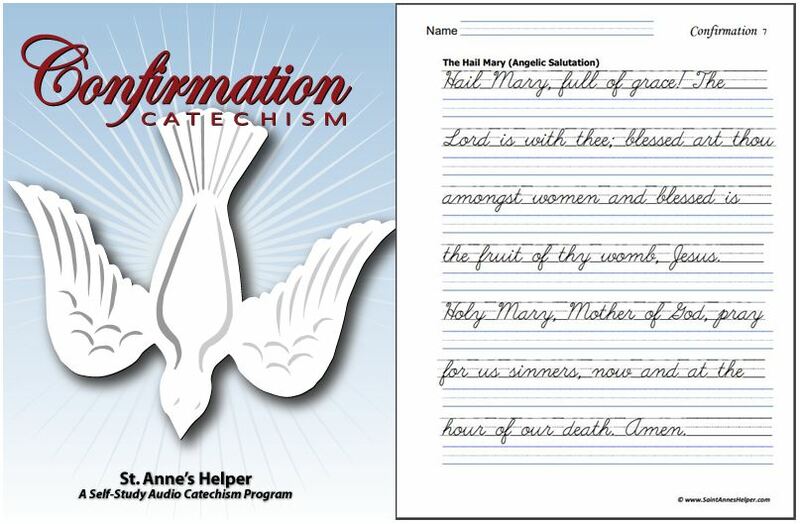 The following directions explain how to use our St. Anne's Helper Audio Baltimore Catechism CDs so as to be able to print the TEXT from the same audio CDs. I like to print double sided to save paper. You can also send the text file to your tablet to read from there. In 2009 we added downloadable Catechism Copybooks and they can be printed at will also. Print as many as you like for as many children as you have or for those in your catechism classes. Print them full size for small children. Print two up for older children who write smaller. See more info about our manuscript and cursive handwriting worksheets here. The same Baltimore Catechism questions, answers, and prayers are in our First Communion and Confirmation eBooklets. How to print these ebooklets? 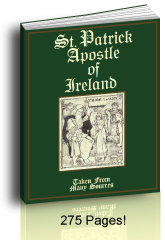 Saint Patrick History - Best story of St. Patrick I've read. and the darling Children of the Kingdom - Lovely A-Z saints book for kids. Usually people read these on an eReaders or Kindle reader, but you can also print from these books since they are in PDF format. 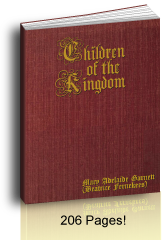 This is especially helpful with the Children of the Kingdom since it can be cozier to read to children from the printed format. We recommend using a binder or taking the printed copy to a store that for a plastic spiral binding with plastic front and back pages. Late in 2010 we added the St. Anne's Helper Catholic Coloring Book from which you can download all of the coloring pages to print that are on our site instead of searching the whole site. It contains over 480 coloring pages to print. They are divided into separate files for your convenience. You have as many print choices as your printer allows. Simply print the coloring pages one up. Use booklet setting to make a greeting card or feast day card. Use the multiples setting to make several miniatures. Print a file as a booklet - depending on how your printer is programmed. You can rearrange the files as you like by numbering the image files in your computer. When you print they will show in the order you gave them. Again, if you need more help, contact us here.